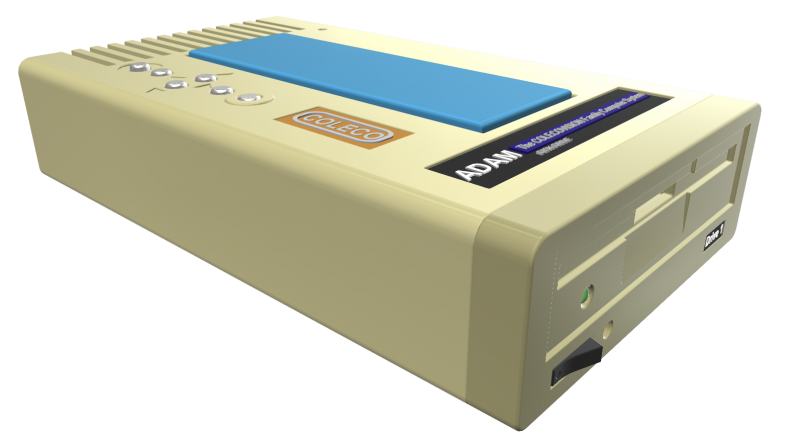 There is a new SD Drive solution for the Coleco ADAM that has been developed by Seam Myers. There are numerous improvements made over the first ADAMnet VDD made available by MicroFox a number of years ago and all the information is available on the Coleco ADAM Facebook page ( https://www.facebook...3&theater&ifg=1) as well as on GitHub (https://github.com/Kalidomra/AdamNet-Drive-Emulator?fbclid=IwAR1Z6pQwLwBW9v2OjTHpPTppQ2SPFwHoxVu2C8_0bRCX7rUcOYLgghk3sfI). This project does not look like it will be mass produced for commercial sale, but all information is available if you have the skills to make one yourself as John Lundy has done and others are planning to do. 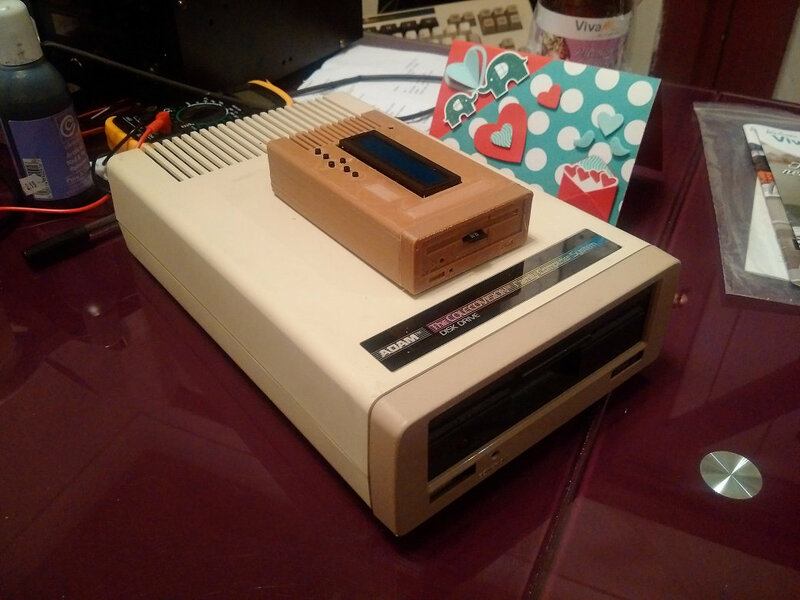 There is also a possible project to develop a Data Drive SD solution that installs in one of the Data Drive bays and connects to the 8 and 9-pin data drive connectors by a student of former Coleco employee Howard E. You can find this thread on the Coleco ADAM facebook page. 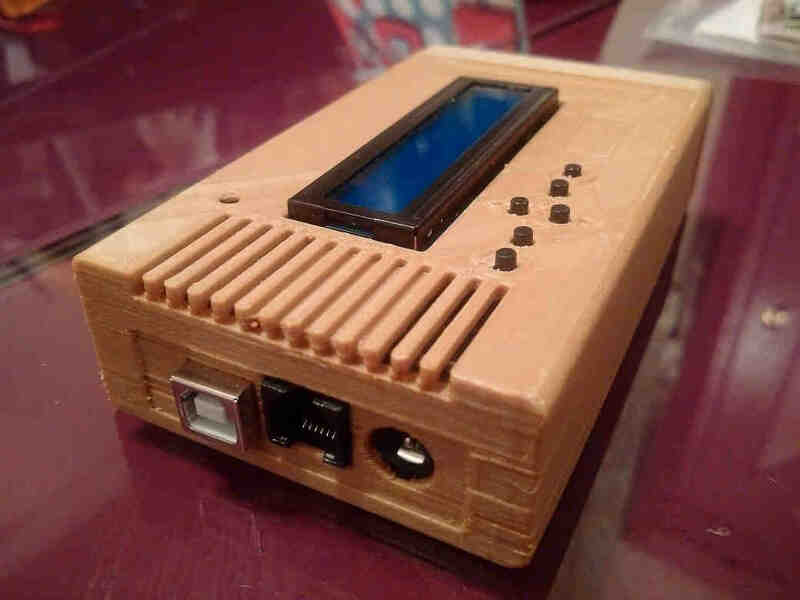 Although I've gotta say, I'm hoping someone looks at this project, and adapts it to the Raspberry Pi...hooking up the AdamNet wire to the GPIO pins and just writing a program to select your image. I'd be 900% more likely to build one then! But yes, this is very, very cool! Sean has stated that he has tried to join AtariAge recently in order to post about his project, but has never been approved. If someone could look into this for him, it would be appreciated. Looks great! Hope I can buy one from someone in the future! A lot of people have already expressed the same thing.... including me!!! Sean Myers released the ADE version 0.4 yesterday. - Added large disk image support. - Added flag to disable the FACE command. This ties in with the large disk image support. - Added SD card commands. Adam can access the directory and mount images. - Added a delay to enable exact timing of an original disk drive. Default is 0. - Added the connection to the AdamNet reset line. This will enable a boot disk to be auto-mounted on an Adam reset. - Added the ability to assign a book disk. - Added the ability to use digital buttons. The boot.dsk concept is what I really like on this release. 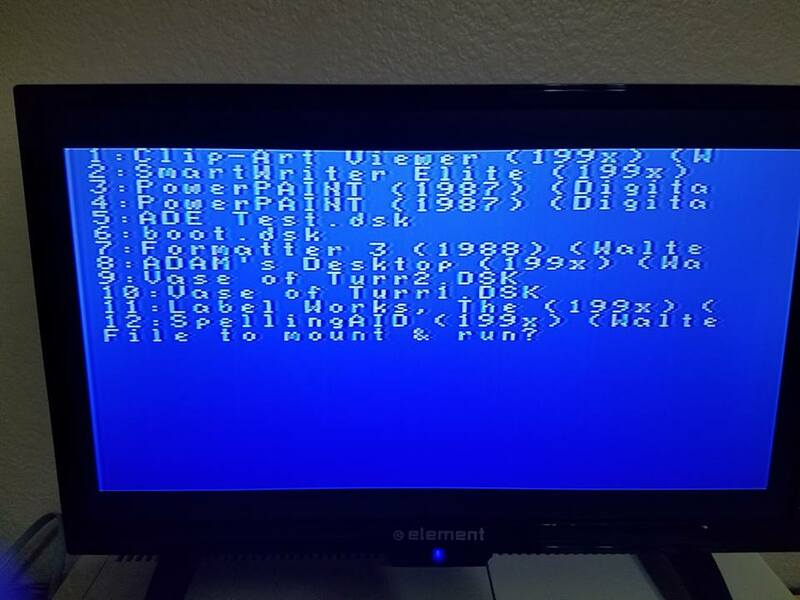 He created a proof of concept boot.dsk image that loads SmartBasic and runs the HELLO program to grab the directory from the ADE SD card and displays it on the ADAM to select and run a program of your choice. I'm thinking William Hicks (Milli) could take his awesome CVE frontend and really make this feature look and perform great. 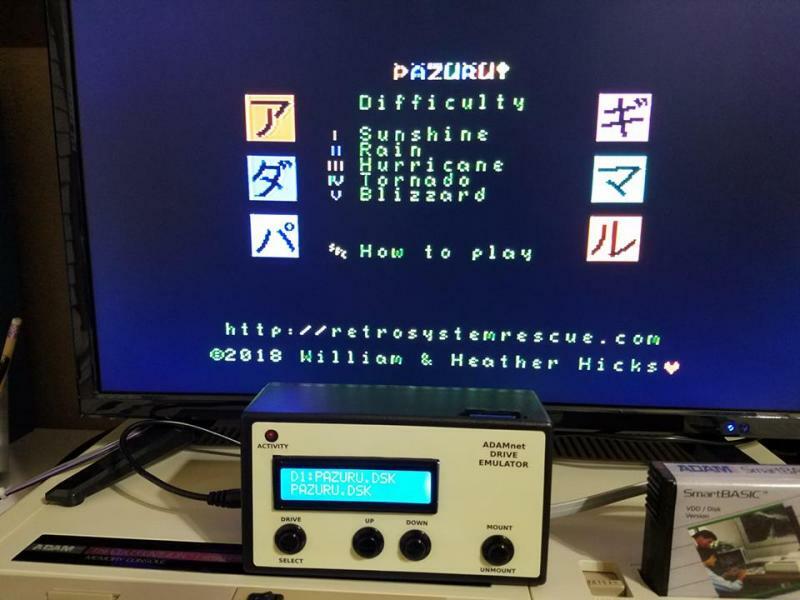 Good news is that it looks like a production run of the ADE will be made and Sean is now a member of AtariAge, so hopefully he will chime in soon. Edited by NIAD, Sun Feb 10, 2019 1:39 AM. I'm rarely induced to come out of the woodwork but I just wanted to say a huge thank you to Seam Myers for making this awesome do-dad available. And to NAID for bringing it to our attention. ​...I'm sincerely glad Seam beat me to it with such an excellent job as I suspect a project like this was going to be a step or two beyond my skills, and so a long + frustrating road. 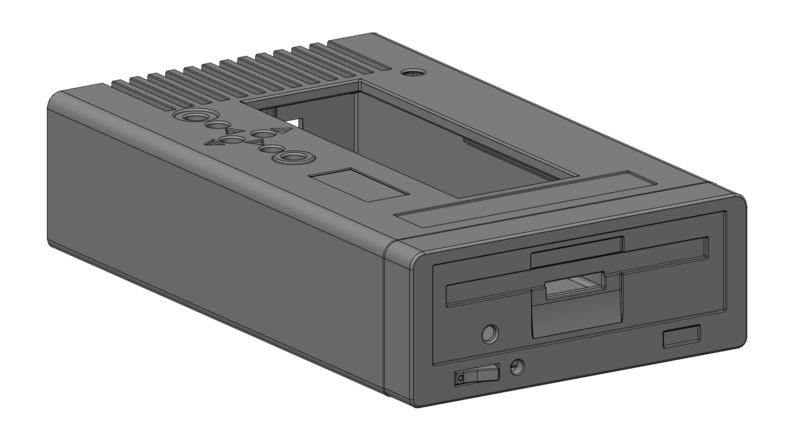 For any with access to a 3D printer I've made a (hopefully) nice ADAM Drive-ish case for this to go in to that I've posted on Thingyverse by way of a thank you. Of course there's the connections to the ADAM to make but even if you've never soldered a few minutes of practice will ensure you're more than good enough and if you're still wary you can bodge the connections easily enough. By way of encouragement my 14 year old daughter built the 'Pro' version of one of these (https://rc2014.co.uk) a couple of weeks ago with no prior electronics or soldering knowledge, and it works! -To make fitting the boards a bit easier. While I have listed my case as non-commercial only on Thingyverse, Sean is of course very welcome to use it should he decide to start selling these, wonders what to put them in, and likes what I've done - feel free to suggest modifications. No I don't want anything, I just want to say thank you. Edited by CharlesMouse, Tue Feb 12, 2019 1:10 PM. Sean, not Seam - Sorry. I uploaded an older photo by mistake - here's the right one. That is awesome Charles. I'm glad that I could be of service by providing this information to you and others. Sean Myers and John Lundy have been awesome with this stuff over on the Coleco Adam Facebook page and I would recommend checking it out and posting everything there as well. That replica disk drive case is awesome! Was very happy to see this. I always planned on doing a selection menu for the SD Drive when I bought the parts I needed a few years back. Looks like there's not much of anything else to come up with,just build it. Sean you the man! Thanks everyone. The case design looks great, I will have to print it this weekend. I would like to hear any suggestions or feedback on the current implementation of ADE. I am currently working on v0.5. It will include a couple of minor features and some code cleanup. I hope someone takes on writing a nice front end for the Adam side. I'm afraid I don't have the energy or the time to learn Z80 assembly. Really nice work here. Thanks for showing it to us. Love the disk drive case style very much. Edited by klasko54, Fri Feb 15, 2019 12:40 AM. Sorry for disappearing for a few days... I'm most pleased my case is a hit, but not half as pleased as I am with this wonderful device - my sincere tanks once again. It seems the specified LCD shield comes as standard with the contrast turned allllll the way down... That gave me a moment or two before I twigged. Somewhat counter-intuitively that little blue pot (top-left) needs something like ten turns clockwise before text will show up - maybe worth a mention on your excellent github page? I'm a long, long way from familiarity with regard to the ADAM's hardware, sorry for a likely dumb question - there's a 5v line on the ADAM Net connector. 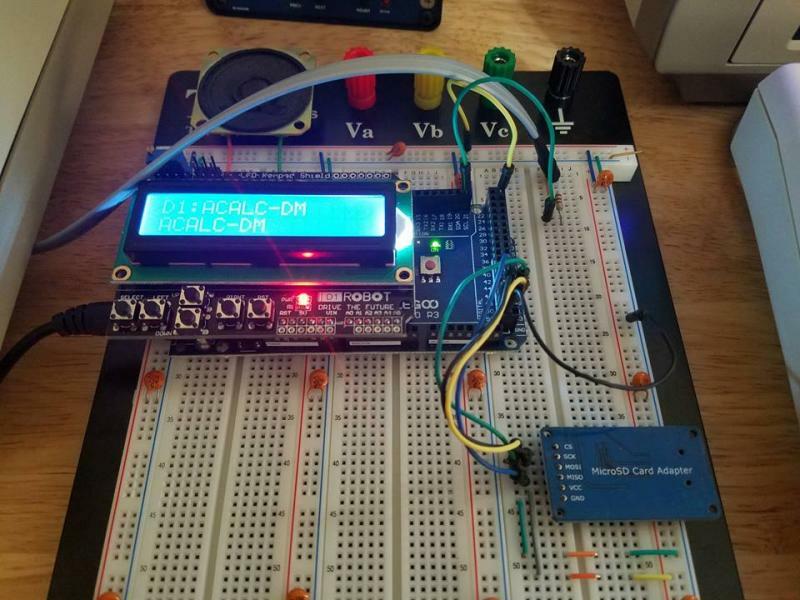 It would save a connection if the Arduino could be powered from the computer - possible? I do have an improved design for a case (same theme) that I've yet to upload - I've not been able to test-print it as my printer's been a right little s*d the last few days... the print head keeps jamming up and despite trying everything I know to fix it it refuses to play ball. If anyone would like me to upload the files anyway just say, but the reason I haven't is it's quite a tight squeeze and I'd hate for someone to spend hours printing it only to find it's not fit for purpose. Many thanks, again, for this wonderful device! Edited by CharlesMouse, Thu Feb 21, 2019 10:04 AM. I've finally gotten my blasted 3D printer working again. After days of messing about it turned out to be nothing to do with the printer but the filament I was using was old and damp - oops! 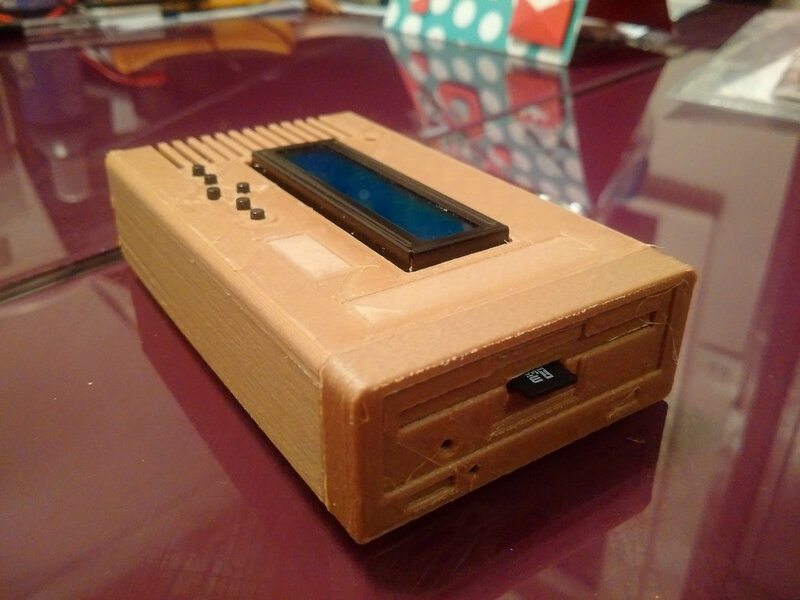 Anyway I've printed a first test of my latest version of a case for Sean Myers genuinely awesome floppy emulator and I'll upload them to Thingyverse shortly for anyone who's interested. Print all parts in the orientation they appear in the .stl files. Base.stl only needs to be reasonably strong so print however you like, but this one will also need support for the lip. -Desolder / cut the pin-headers from the LCD module and do the same to your lovely Arduino! Also trim down the connection pins that poke up next to the LCD. -Pull the plastic header sockets from the Arduino and desoler / cut all the pins!!! -Solder in the resistors and wires for the ADAM Net connector, long enough to reach from the front to the back of the Arduino. 6 Pin RJ11 connectors can be bought for buttons on eBay, just be sure you bend the pins flat and solder carefully being sure not to add height to the connector (it gets sandwiched between Arduino and the case top. 1) The LCD panel doesn't sit in the right place to be able to make a nice ADAM FDD box so to move it requires wire connections. ...another option is to get some (small) tact-switch tops and push them through the holes in the case before installing the module - it work's fine but is frustratingly fiddly to keep them in place. 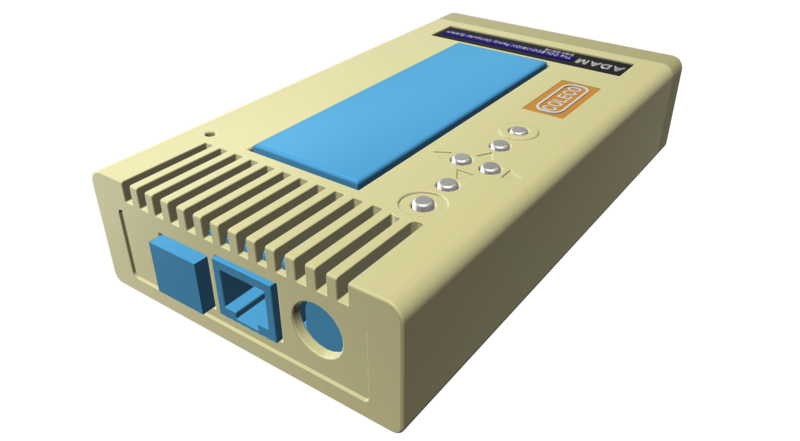 -Take your RJ11 connector on it's flying leads and push that though it's mounting hole in the top shell of the case. You'll notice it's legs will engage with the case with a bit of fiddling. -Carefully, but firmly push your LCD / Arduino sandwich in to the main case taking care to line up the tact-switches. With a bit of pressure the edges of the main LCD PCB will snap in to the walls of the case. -Carefully push down on the Arduino PCB so that it's power and USB sockets line up with the holes in the back. You'll note the RJ11 socket fits between and is now held firmly by the case and the Arduino. -Slide the base into the top, being careful not to snag anything and keeping the microSD adaptor dangling on it's wires out the front. The front lip of the base has a couple of tabs to engage the Arduino and so hold that firmly in place too. I couldn't think of a 'snap together' solution for the microSD adaptor in the space I'd left for myself. -Take your faceplate and push the microSD adaptor fully in to it's slot and glue it in place - sorry! -The faceplate can then be, carefully, pushed over the open end of the case and should also snap in to place. ...There should be room for the microSD board to fit between the LCD module and Arduino but be careful not to snag any wires. And it's all together - phew! Below are some piccies of my first trial assembly. It's a bit wonky because the microSD board wasn't glued at that point. I hope it's of use to someone and the assembly process hasn't put people off! Yes, I printed it with wood filament as that was the closest match I had to the ADAM (not close!) It seems beige printer filament is really, really expensive. When I've had a chance to play I'll probably sand / paint / print some stickers to finish the job, as per my mock-up further up this thread. Once again my sincere thanks to Sean Myers for this awesome project and for be generous to share. It's made a huge difference to my enjoyment of my ADAM. 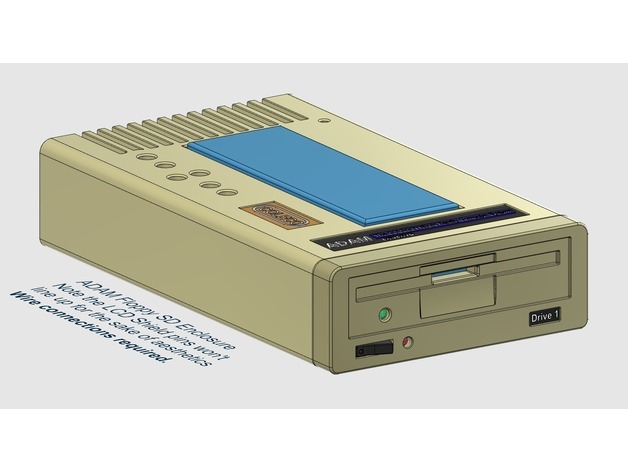 -At present the virtual floppy drive is always blank on power-up. It would be nice if at power-up the last image mounted was still present. -There are minimal Arduino Mega compatible boards to be found on eBay. I'm tempted to see if I can use one to make a smaller / easier to assemble spin on the above case using one. Of course if Sean was to do that officially that would be great for published user options, and save me burning through too many precious brain cells. Changed how the AdamNet line is connected; it now requires a PNP transistor and 2 resistors. This version is not compatible with the old method of connecting the AdamNet line to the Mega2560. This was required to improve the reliability of the AdamNet communication. Added the device configuration mode. Enables any drive to be turned on or off. Added a voltage monitor mode. Added extra step to send SD commands and access large disk images. This will enhance Adam program compatibility, while maintaining the ability to use SD commands and very large disk images. Fixed a write bug. ADE was not sending the required ACK after receiving the block data to write. Fixed a timing bug in Process Command. ADE was sending the ACK back to the Adam too fast, it was sometimes missed. Can anyone comment on the differences between this and the MicroFox CF flash interface (which I currently have)? A big one is obviously SD -vs- CF which are becoming harder to find. Just wondering what some of the functional differences/improvements are. For one thing, it'll run ddp images. The MicroFox one only runs disk images. The MicroFox IDE CF Package is a Hard Drive setup for the ADAM where you have to setup the actual ADAM program on partitions, the operating system (EOS) has to be patched to recognize it and there are numerous EOS programs that are not compatible with it such as the Super Games. On the T-DOS side, it really shines! The MicroFox VDD and Sean Myers' ADE are disk drive emulators that use any and all disk images of ADAM software. Everything is compatible with these SD Card drives on the EOS or CP/M / T-DOS side. Think of these SD drives as owning an actual ADAM Disk Drive and mounting and unmounting disk images is like inserting and removing actual diskettes. Good news is that it's great to have both the IDE CF package and the VDD or ADE SD drive and you can use them in conjunction with one another. The SD drive emulators are the better choice for most and Sean Myers' ADE is the one to go with now. How is this new SD drive better than the one I bought a couple years ago? What are the new features? - some VDD owners had issues with loading specific programs where communication with the Adam would be lost for some reason. No issues with the ADE. - up to 4 disk drives emulated at same time however the software program has to be configured to access all 4 so 2 is the norm. - access to 300 image files in the root versus the VDD's 100. - professionally assembled by John Lundy. There are more that you can view on Sean's GitHub website linked at the beginning of this thread as well as John Lundy's posts on the Coleco Adam Facebook page. More updates, wonderful and many thanks. This device is of course awesome, but like all great things you get users making feature creep requests. If I might ask it would be great if a future revision supported folders on the microSD card. Edited by CharlesMouse, Sat Mar 23, 2019 9:08 AM.